The Division of Student Affairs has worked hard over the past decade to enhance its programs for new students. 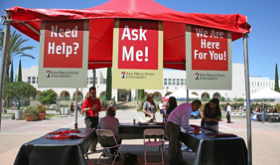 During the first few days of each semester, Student Affairs hosts “Ask Me!” tents in high-traffic areas to provide students with directions, information, and a friendly face. New Student and Family Convocation: This ceremony officially welcomes new students and their families to the university. Welcome Week: Over 95% of new Aztecs participate in these events, including New Student and Family Convocation, the Red and Black Welcome Back Dance, Screen on the Green, and others. In 2005, the Office of New Students and Parent Programs revamped Transfer Student Orientation to provide more specific and detailed information relevant to transfer students. One of the Welcome Week highlights for students is the Aztec Bash@State, which includes a barbecue for new students.